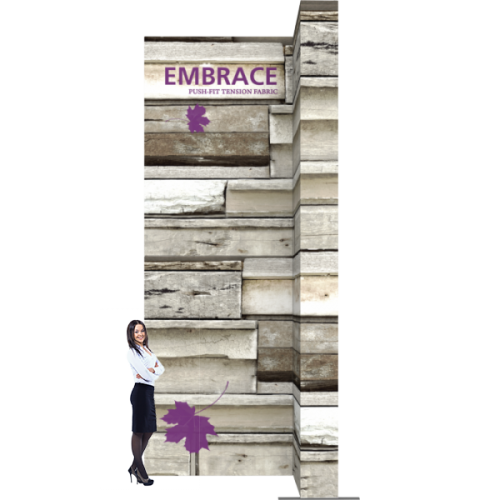 The Embrace™7ft wide Stacking Push-Fit Fabric display is nearly 15ft tall and creates a commanding presence in minutes! The frames are collapsible, lightweight and portable. The display kit includes four anodized silver collapsible frames, specifically two 2x3 frames stacked as the backwall and two 1x3 frames stacked on the right. Also included are perimeter channel bars and four push-fit fabric graphics, which are offered with or without endcaps, single or double sided. The four frames are connected together easily with a simple clamp system. Embrace displays feature seamless, clean, crisp lines due to the push-fit fabric graphics that hug the collapsible frames. No tools are required for assembly. Embrace 5ft Tabletop Push-Fit Tension Fabric DisplayEmbrace™5ft (2 Quad x 1 Quad) is a sleek, collap..